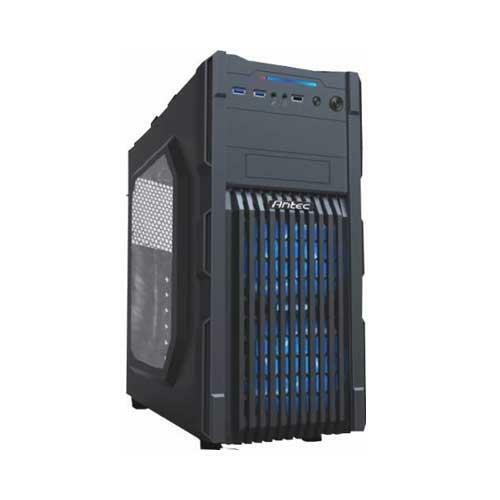 Designed for entry level gaming builds, the GX200 mid-tower case by Antec sets the standard for fast, economical gaming builds. The rugged exterior styling is accentuated with a front intake grill that optimizes airflow and includes a removable dust filter. Inside, the GX200 boasts a spacious interior, ideal for high performance graphics cards up to 15? (380 mm) in length. The extra-large CPU cutout, routing holes for cable management, and seven expansion slots allow for a versatile, builder-friendly experience. And we?ve included USB 3.0 connectivity on the front panel, for lightning fast data transfer and compatibility with next-gen peripherals. On the top of the case, the convenient storage compartment lets you easily store your accessories and mobile devices. The GX200 gives you the features you want, without losing sight of performance and?value.